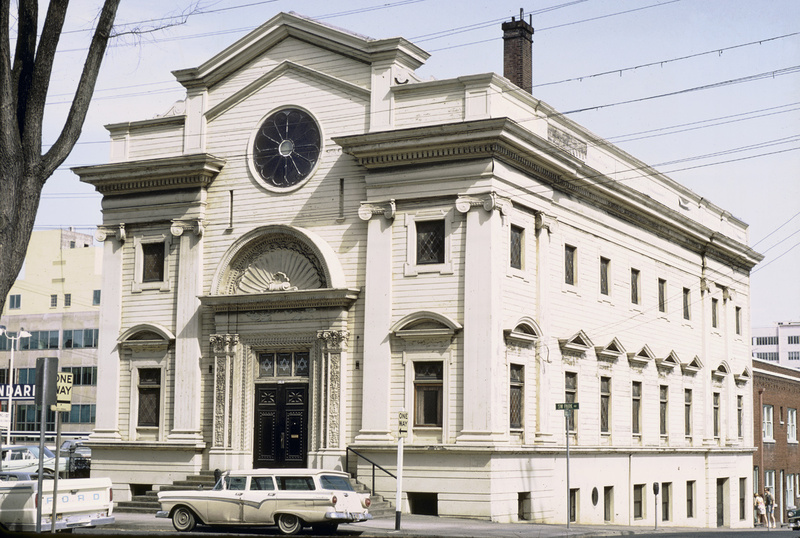 Ahavai Sholom Synagogue once stood on the northeast corner of SW Park Avenue and Clay Street. It was built in 1904 and sold when the congregation moved to a different location in 1952. It served various other purposes, including a gymnasium for Portland State University, until it was demolished in 1978. Beautiful building Dan. That entrance is truly majestic. Do you know of any earlier photographs? I get the idea that the horizontal siding just under the triangular pediment (above the rosette) is a later addition or remodel, as well as the uppermost portion of the building. The top of the building looks like it may have originally been designed with a balustrade rather than an opaque flat surface. It’s a gorgeous building and I wish it had survived, but it just looks a little “off” to me. I hope the entrance was saved and re-purposed. This Edgar Lazarus (as in Vista House, etc…) designed synagogue will be making an appearance in the upcoming program on Lazarus at the Architectural Heritage Center on April 9th. More info at VisitAHC.org. Does anyone know where the records of the Ahavai Sholom synagogue went to, or where the congregation moved to? Ahavai Sholom merged with Neveh Tzedek, and is now Neveh Sholom, in SW Portland on Dosch Road. (The one with the giant 10 Commandments.) If you are looking for old Ahavai Sholom records, you can check there. wow that doorway is cool looks like a church form italy ! !